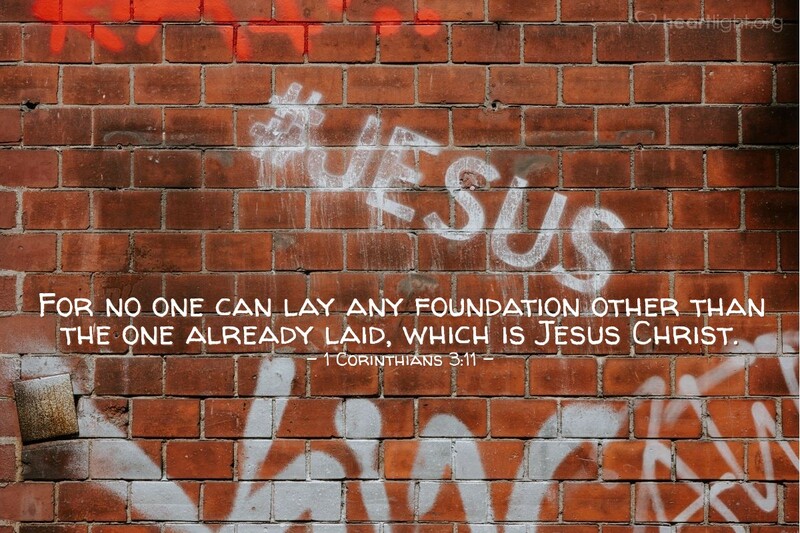 There is only one foundation on which the Church and the Christian life can be built. That foundation is Jesus Christ (cf. 1 Peter 2:4-7; Ephesians 2:20). He is the one whom God sent to save us (John 3:16). He is the "way, the truth, and the life," the only way to God (John 14:6). The Lord Jesus Christ is the name above all names, the name at which every knee will bow (Philippians 2:5-11). His is the only name by which we must be saved (Acts 4:12). Let's take time today to specifically honor Jesus as Lord with our hearts, our words, and our actions. Lord Jesus, your name is above every other name that has ever been named. Your glory extends back beyond creation and will endure after the light from every sun has been extinguished. Your sacrificial love that saved me is awesome and beyond compare. Please receive my heartfelt adoration and praise. To you belong all glory, majesty, power, and grace for what you have done to save me and what you will one day do to bring me home to you! Amen.